Opel announced a limited edition, the Corsa OPC Nurburgring Edition, with a production run limited to 500 units. The sporty Opel OPC model has a power increase of 18hp and torque increase of 20 Nm over the stock Corsa model. 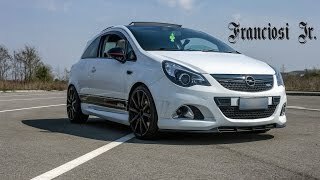 The Corsa OPC “Nürburgring Edition” reaches 100 km/h in just 6.8 seconds and a top speed of 230 km/h. Rüsselsheim. The sporty Opel OPC model family now has two attractive new members. The sporty small car segment is expanded with the 154 kW/210 hp Corsa OPC “Nürburgring Edition” in a limited edition of around 500 units. 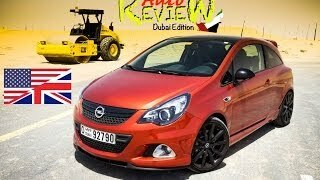 It differs from the familiar Corsa OPC by an increase in output from 192 to 210 hp and an increase in torque from 230 to 250 Newton meters. Additional traction and drive stability are ensured by a mechanical multi-plate limited slip differential, a newly developed sports chassis by Bilstein and a high-performance braking system by Brembo. The Opel Performance Center (OPC), responsible for the sporty accents in the Opel model lineup since 1999, is a decisive element in the brand’s value profile. It embodies a high level of emotionality and passion for striking design, top-class technology and extraordinary driving dynamics. The vehicles with “OPC” in the model name are positioned as the top-of-the-line sporty variants of the respective model lines, and demonstrate the brand’s high potential and technical expertise. Over the years, the OPC models have not only established themselves as high-performance brand ambassadors with a high emotional factor, they are also commercially successful: from 1999 until today, around 60,000 units were sold worldwide. The biggest seller has been the Astra OPC (around 22,000 units, 1999-2000 and 2002-2010), ahead of the Zafira OPC (around 15,600 units, 2001-2010) which, as “Europe’s fastest van”, defined a new sporty niche within the van segment. It is followed by the Corsa OPC with around 14,500 units sold (2007-2010). The OPC models in the high-performance mid-size class also made a major contribution to the sales success. The foundation was laid by the Vectra OPC with over 3,000 units sold (2005-2008). Building on this, the Insignia OPC introduced in 2009 reinforced the trend and sold more than 3,000 units in the first two years (2009-2010). The most important markets were Germany (around 33 percent), Great Britain (some 28 percent) and Switzerland (around 14 percent). In addition to performance-oriented OPC model buyers, many customers also individualize their Opel production model with top-quality “OPC Line” accessories. These can be ordered directly ex works for new cars. People who already own an Opel can have their vehicle retrofitted by an authorized Opel service partner. The OPC Line offers bodywork components, alloy wheels and interior details such as steering wheels and gearshift levers which have all been developed and fine-tuned for the respective model by Opel designers and engineers. The articles fulfill the most demanding requirements in terms of quality and fit, and come with a 24-month works guarantee. The exclusive OPC Performance Trainings, offered since the fall of 2006, are extremely popular with ambitious drivers and booked out well in advance. They are open not only to Opel drivers or owners of OPC models, but also to drivers of all makes of vehicle. The exclusivity of the one-day event starts with the location. It all takes place at the usually tightly screened-off Opel test center in Dudenhofen, where prototypes and future Opel models are developed to series production. Participants learn to use the dynamics of the OPC models in a controlled and safe manner from a professional team of instructors under the watchful eye of the former Opel works pilot, Le Mans champion and brand ambassador Joachim Winkelhock. The primary aim of the training is maximum driving fun through maximum vehicle control. The performance driver training concept also served as the basic idea and the basic training for “OPC Race Camp”. This novel motor sports format developed by Opel is distinguished by several innovations: only normal drivers who show talent are allowed to participate, the selection and the various training stages take place in the popular casting elimination format – and the winners can look forward to driving for Opel at the 24-hour race on the Nürburgring. The public and media response to the first two seasons (2008, 2010) was enormous. Over 22,000 aspiring racing drivers applied for the second season, 750 of them made it to the short list. The top eight reached their ambitious target after 12 casting stages. With two Astra racing cars with over 300 hp they not only attended the legendary long-distance race in the “green hell”, but played a central role in it. The high standard and quality of the training concept were clearly reflected in the final result. In a field of just under 200 vehicles, wheel to wheel with professionals and racing legends like Hans-Joachim Stuck, the race camp rookies took places two and three in their class and the positions 19 and 22 in the overall standings. Enthusiasts and Opel fans are already impatiently awaiting the next OPC project. OPC engineers are planning the third generation of the Astra OPC. As the top model in the Astra range, the coming Astra OPC will open a new chapter in the compact sports car segment. At the 2010 Paris Motor Show, Opel gave a glimpse of the dynamic lines, sculpted surfaces and powerful appearance with the Astra GTC Paris study. The dynamic three-door model’s propulsion, a high-tech turbo engine with direct gasoline injection, provided an initial impression of the future Astra OPC’s tremendous driving dynamics and performance potential. 1999: Market launch of the first generation Astra OPC (2.0-liter aspirated engine, 118 kW/160 hp) – the limited edition of 3,000 units is sold out within four months. 2001: Market launch of the first generation Zafira OPC (2.0-liter turbo engine, 147 kW/200 hp) – around 12,000 units sold up to the model update in 2005. 2002: Market launch of the second generation Astra OPC (2.0-liter turbo engine, 147 kW/200 hp) – available as a three-door version and station wagon. 2004: Launch of the OPC Line range. 2005: Market launch of the current Astra OPC (2.0-liter turbo engine, 177 kW/240 hp); Market launch of the second generation Zafira OPC (2.0-liter turbo engine, 177 kW/240 hp);Market launch of the Vectra OPC (2.8-liter V6 turbo engine, 188 kW/255 hp) – available as a sedan and station wagon. 2.8-liter V6 turbo engine with 206 kW/280 hp for the Vectra OPC. Optional six-speed automatic transmission for the Vectra OPC. 2008: Special model Astra OPC “Nürburgring Edition” in limited edition. 2009: Market launch of the Insignia OPC – available as a 4/5-door sedan and Sports Tourer with the most powerful Opel production engine of all time (239 kW/325 hp). 2010: Second season finale of the Opel racing driver casting “OPC Race Camp”: number 2 and 3 in their class (SP3T) and 19 and 22 in the overall standings (196 vehicles) for the two Astra racing cars at the 24-hour race on the Nürburgring.